Companies look beyond connectivity and see technology as a tool for business transformation. Over the next few months and years, a growing number of mid-market, large and multinational companies will learn that significant gains can be made by integrating tangible and intangible organizational assets – network, people, processes and collective knowledge – to boost productivity and efficiency and achieve a competitive advantage. In doing so, a new type of company will arise: what we at Alcatel-Lucent (News - Alert) call a Dynamic Enterprise. No two Dynamic Enterprises will look alike. Each company’s communications assets are based on the competitive landscape, technological maturity and the CIO’s mandate. Different markets pose unique challenges, and those factors influence an organization’s network infrastructure needs. Technological maturity, and the ability to make sophisticated decisions, involve not only being aware of new technical developments but also understanding how new technologies can be integrated into the enterprise to leverage the four key assets and gain a competitive advantage. These factors help explain why the role of most CIOs has changed so dramatically over the past five years. Today, most CIOs are part of the management board. Their new responsibilities make it necessary for them to look beyond technology toward enabling business objectives such as attracting customers and supporting key processes. Thus, in Dynamic Enterprises, CIOs must carefully tailor their portfolio of projects with an eye to realizing a comprehensive business transformation over a period of time. These new types of companies do share one thing in common: in order to become a Dynamic Enterprise, it is not enough to simply throw new technology at a challenge. At Alcatel-Lucent, we believe that success depends on the nuanced ability for companies to assess their own business objectives, assets and requirements and plan for a gradual migration (Figure 1). Put differently, the Dynamic Enterprise is more of a journey than it is a destination. Inefficient business processes can be traced to an organization’s inability to deliver the right information to the right people at the right time. And knowledge management specialists agree that explicit company knowledge (structured information maintained in databases, for instance) accounts for as little as one-fifth of all information that can potentially be used by organizations to make good decisions. Tacit knowledge (unstructured because it exists mainly in the minds of individuals and in private areas such as hard disks) represents the majority of the information. Dynamic Enterprises understand the need to unleash “connected knowledge” by making the collective knowledge accessible in real-time – anywhere, anytime, on any device – to the business community, thereby unleashing the value of the intangible asset associated with connected knowledge. Until recently, there were few solutions available to address this requirement. However, the rise of social networks and Web 2.0 services in the consumer arena offer enterprises critical insight into how the problem can be solved. Technologies such as Wi-Fi, broadband and smart devices are entering the enterprise. The rapid introduction of these technologies is being driven by a new generation of users who are willing to use the most convenient tools to achieve their jobs, regardless of the corporate solutions developed by IT. We fully expect the enterprise to turn to users to play a big role in influencing which technologies are deployed and how they are used as new collaborative applications based on Web 2.0 are imported into the enterprise arena. This fusion of Web 2.0 with corporate usages results in what is now referred to as Enterprise 2.0 solutions. These new solutions can provide access to the collective knowledge within companies. And if a company integrates this collective knowledge with real-time communications, it can have a significant business advantage by linking the right people at the right moment on the right device. It allows Dynamic Enterprises to integrate real-time communications solutions (applications, devices and network infrastructure) with Enterprise 2.0 services such as corporate wikis, blogs and other “professocial” networks used by employees, partners, suppliers and customers. They establish the foundation for connecting knowledge in a way that drives broader convergence between the network, IT and business processes to better achieve mission-critical objectives. This represents a new paradigm in managing technology. Today, open standards and open-source capabilities are driving new technology develop-ments so that a wide range of devices and applications can be integrated. Open and flexible solutions are a must in order to build end-to-end networks that link both the enterprise and carrier worlds; standards-based technologies such as IP are essential if companies are to migrate successfully and anticipate future communications advances. Ten years ago, single-vendor, proprietary solutions for voice, data and early mobility were viewed as tools for helping companies using those unique solutions to differentiate themselves. The emergence of the Internet as a business tool, however, illustrates how far we’ve come in the evolution of open systems. As soon as the network becomes standards-based, it can no longer be considered a sufficient framework for competitive differentiation. Everybody can have IT at a total cost of ownership that breaks the entry barriers and transforms the market, both techno-logically and from a business perspective. In this process, differentiation is flattened. Although enterprises (particularly those with multiple locations) saw cost control as the first visible benefit of IP deployment, it soon became clear that the real value of IP rests in its ability to integrate voice and data in a converged way to support a new breed of applications that can bridge the network and IT worlds. The unified communications market, which emerged five years ago, promised to improve users’ efficiency and productivity. This created a shift away from the network and technology dimension to the user dimension. This shift acknowledged users as an important company asset and businesses shifted, focusing on equipping users with the right solutions to support their roles and functions. The evolution of communications investment continues today. Once the right solutions have been deployed for the right users, some companies are looking for communications solutions to reduce business latency, ensuring that the right person has the right information at the right moment. Meeting this requirement requires the ability to integrate business applications — or their attached processes — with real-time communications. This is the key to enabling business-driven and context-rich notifications on any device. It also allows for the triggering of instance-related automatic outbound calls in the context of customer service for companies that integrate their contact center operations into a broader customer service chain. A number of technologies must be well understood and managed if companies are going to progress on their paths to becoming Dynamic Enterprises (Figure 2). · Mobility – and all of the technologies that enable people to access the resources they need from any place and at any time – has been a key force driving enterprise transformation. As people become increasingly mobile, there is also greater pressure to boost their productivity and their ability to positively influence any business situation. As a result, the enterprise network infrastructure needs to be able to support mobility. There are many technologies that can get this done. The rapid adoption of Personal Area Network (PAN), LAN, WLAN and Wide Area Networks (WANs) – in conjunction with mobile applications such as push mail systems, unified communications, ubiquitous Internet Protocol (IP) calls that can be made from almost any type of terminal or device – are changing actual business strategies. The types of information that these technologies can exchange encompasses a wide range, originally stored into corporate databases and applications (such as supply chain, CRM, human resources or any other business-critical application – industry-specific or not). 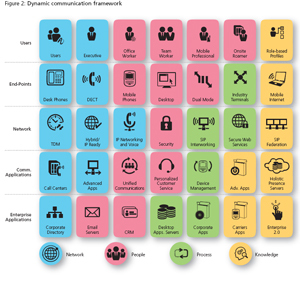 Since it is unlikely that each of a company’s employees will use the same communication end-points, mobile operating systems and desktop applications, it is then essential to use standards-based architectures that are application, location and device-neutral from a federation perspective. · A second technology that has a key role to play in the Dynamic Enterprise is Web Services. There are two reasons for this. First of all, in order to integrate corporate applications, organizations need secure Web Services capabilities that enable a dialog between these applications and real-time communications solutions. Second, Web Services enable integration between Enterprise 2.0 and real-time communications solutions to transform collective knowledge into connected knowledge. · Security technologies are also critical. While a tremendous amount of progress has been made on the standards and technology development fronts associated with security, trends like mobility and social networking have introduced new risks and threats. The role and scope of security has changed dramatically over the last couple of years and now must also support the challenges posed by mobility and platform computing. For instance, three years ago the main security challenges involved data protection and intrusion prevention. · Enable efficient demonstration of regulatory compliance. Bottom line, companies must enable secure information flows throughout processes and across Enterprise 2.0 services, which can also ultimately be considered a process. · Single identity, which ensures corporate-wide consistent policy. Using a search engine based on tags, Enterprise 2.0 applications point people to the right information and then provide immediate access to the information they need regardless of the time of day or device they use. This allows organizations to gain access to the collective unstructured knowledge, which so far has been inaccessible. Wikis, contributions to blogs and social bookmarking services offer access to new, reliable and up-to-date sources of information in a dynamic fashion. And the good news is that these services can complement existing Intranets and other corporate IT investments. By integrating Enterprise 2.0 with real-time communications solutions, users will know how to quickly contact those who have information. In the process, they will lower human latency and increase business efficiency. 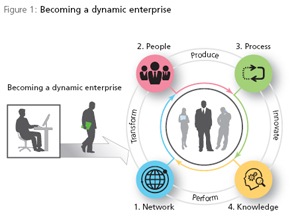 The key to success for Dynamic Enterprises is to move beyond focusing on how information interacts with systems and turn every interaction into a business opportunity by offering different types of workers within an organization the ability to access, interact with and manage the information they need in a secure and appropriate manner. This requires technology professionals to have a solid understanding of the different types of users that exist within an organization and provide them with the right solutions to enable empowerment and productivity. In addressing these five different profiles, we have built user profile packages that embed networking technologies, communications applications and devices. Each package is based on the profile of users that enterprises want to address. The end-result is a series of off-the-shelf solutions that accurately address each employee’s individual needs. Moreover, Alcatel-Lucent has integrated business processes and Enterprise 2.0 services into key solutions to more closely tie together communications solutions and business purposes. Our implementation of a web-based architecture supporting Web Services (such as Service-oriented Architecture [SOA]) enables communications with these applications or services. · Web Services and support for SOA. Finally, we have developed a unique program for integrating our solutions with those of third-party providers, including more than 50 Alcatel-Lucent Applications Partners and/or Alliance Partners such as IBM (News - Alert), Nokia and Microsoft, to deliver vertical applications or address specific customer needs. This partner ecosystem is complemented by strong relationships with all major carriers worldwide, either to partner around Managed Communications Services offerings or to deliver on the promise of end-to-end IP networks, which are the foundation for the enterprise of the future. We fully expect that Dynamic Enterprises will represent a major source of demand for communications services in the months and years to come. Their communications and IT processing needs will be extremely sophisticated. That is why Alcatel-Lucent works every day to innovate and to invent the communications technologies, platforms and business models of the future. – Xavier Martin leads Strategic Marketing for the Enterprise Solutions Division, Alcatel-Lucent, Colombes, France. Click to the Enriching Communications article page to access the pdf download, any related materials, contact the author and/or request any additional information. 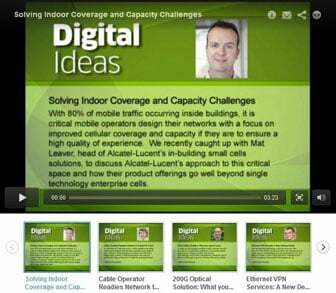 © 2008 Alcatel-Lucent. All rights reserved.